INTRODUCTION: A large private operating theatre complex was investigated to address the lack of published South African benchmarks for utilisation. All major theatres were staffed during normal working hours (07h00 - 19h00), emergency cases being provided for on an ad hoc basis through spare capacity. METHODS: An extensive billing database, amounting to 28 991 records of procedures performed during normal working hours and spanning the period October 2007 - February 2010, was data-mined using Visual Basic for Applications (VBA) scripts. Theatre utilisation was analysed per day, per theatre. RESULTS: The results showed an average utilisation of 43% with significant variation in day-to-day operations. If the very underutilised minor theatre was excluded from the analysis, overall utilisation rose to 48%. Individual theatre utilisation ranged from 14% to 61%. An analysis of change in utilisation with time during a day showed that peak utilisation of 71% was achieved at 09h30 (90 minutes after lists start). Utilisation dropped to 25% at the end of the working day and was sustained for some time after hours. CONCLUSION: The 48% utilisation observed was significantly lower than the global benchmark of between 70% and 80%. The private hospital business model generates earnings only when a theatre is in use. Utilisation is therefore a simple and adequate measure of the efficiency of a theatre, because its ability to generate revenue (its efficiency) rises as the time for which it is used increases. It is generally agreed that utilisation of theatres in South African (SA) public hospitals ranges between 30% and 40%, although these figures have not yet been supported by published work. There appears to be no published research giving utilisation benchmarks for private operating theatres in SA. Attainment of utilisation levels between 70% and 80% is realistic and can meet variations in demand resulting from complications arising during procedures. Several descriptive studies support this finding. [5,6] Computer simulations and mathematical models, both of which are essentially idealisations, compute the practical capacity for operating theatres at between 80% and 90%. Utilisation of 100% is referred to as 'the holy grail', because it is essentially sustainably unattainable owing to unavoidable variations in procedures and loading. This study investigated the efficiency of an operating theatre complex in a large private hospital in SA by measuring utilisation levels and using the result as a proxy for the effectiveness with which the complex can generate income for the hospital. Theatre billing records were made available by the hospital for data analysis. The data consisted of 28 991 surgical records from October 2007 to February 2010. The time used was calculated as the difference between a patient being clocked in and being clocked out. The time available was recorded as the daily working hours, which were 12 hours from 07h00 to 19h00, every weekday. All major theatres were staffed during working hours; a single minor theatre was in use on only 2 days per week. No theatre was reserved for emergency cases, provision being made for such cases on an ad hoc basis. Theatre changeovers were computed and added to utilisation figures on the assumption that such actions, though not adding value, were essential. d. Uniqueness checks (were there duplicate records?). 2. Erroneous data were repaired where possible, or otherwise deleted. 3. Public holidays and weekends were removed from the data. 4. The overall data were split into separate theatres for targeted analysis. a. Working hours only were counted as 'time available' - see the equation above. b. All the time during which a patient was clocked into a theatre was counted as 'time used'. 6. The code calculated a daily utilisation value for every theatre over the 29 months of data analysis. This was done by dividing the hours worked per day in a theatre by the number of working hours available. a. The mean was given as the average utilisation for each theatre, using the daily utilisation values. b. The SD was calculated per theatre, giving a sense of the dispersion of the data - the greater the SD, the less tightly the utilisation rates were clustered around the mean. 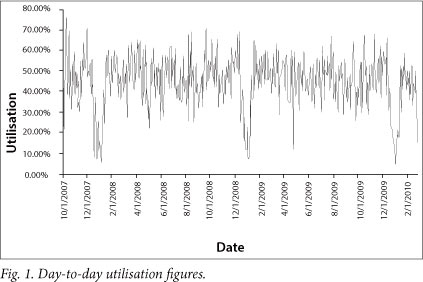 c. A half-hourly analysis was conducted to see how utilisation varied from time to time during a working day. The data integrity was found to be excellent. Only four records were deleted for obvious errors, amounting to only 0.01% of procedures. These errors included an ending time preceding a starting time, a duplicated record, and two surgeons simultaneously operating on two different patients in the same theatre. Occasional additional minor errors were found, most frequently that surgeon and anaesthesiologist were switched around in the record. Over the test period 2 240 different procedures (identified by Current Procedural Terminology (CPT) codes) were performed, of which 1 154 single procedures (51%) were performed more than five times. The number of times an individual procedure was performed ranged from 4 to 1 743. The data showed 12 487 lists during the study period, the average list comprising 2.3 surgical procedures. The mean list duration was 135 minutes (360 minutes being allocated as a rule). Fig. 1 shows the day-to-day utilisation figures for the theatre complex. The data show clear seasonality with very low utilisation towards the end of December when South Africans, surgeons included, generally take leave. Overall daily theatre complex utilisation ranged from a minimum of 3% to a maximum of 76%. A downward trend in utilisation was shown, possibly indicating the increasing use of medical procedures supplanting surgical operations over time. The data per theatre are shown in Table 1. It was calculated that there were 630 working days, excluding weekends and public holidays. The total number of minutes for which a theatre was used over the study period is shown, as are the number of procedures performed over the course of the study, per theatre. From this, an average loading per theatre is given. Fig. 2 shows the overall utilisation of the theatre complex, which was 44%. 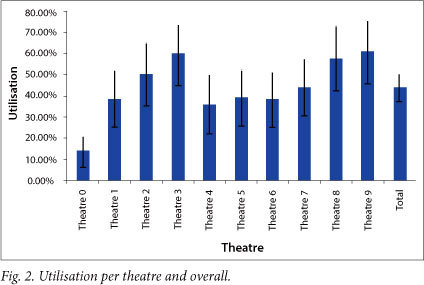 Theatres had varying utilisation levels, ranging from a low of 14% for theatre 0 to a high of 61% for theatre 9. There were significant SDs for each theatre (indicated by error bars), indicative of high day-to-day variability in utilisation. 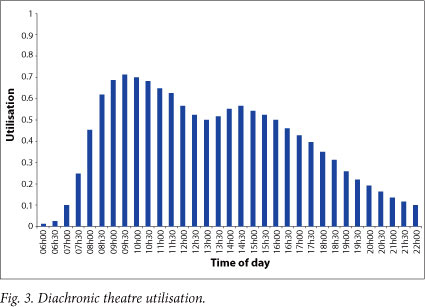 Utilisation of theatre 0, the minor theatre referred to above, was only 14%, reflecting its use on only 2 days per week. When the data were reprocessed excluding this theatre, utilisation for the complex rose to 48%. Time taken for theatre changeovers and machine servicing was excluded in line with international standards, wherein these activities are viewed as necessary but not value-adding. Changeover times were well within world best practice, being an average of 8 minutes and 26 seconds. Utilisation rose to 52% when changeovers were included. Fig. 3 presents an analysis of diachronic data depicting how utilisation for the theatre complex differs at different times of the day. Utilisation spiked at 09h30 on a working day with a level of 71%; a second minor peak occurred at the commencement of the second list for the day, though it was offset by 90 minutes from the actual starting time of the list. Thereafter utilisation declined towards 25% at 19h00, marking the end of the working day. Academic literature on utilisation of operating theatres in private hospitals in SA is lacking. Nevertheless, a commonly held view that emerged during discussion with hospital managers was that operating theatres in private hospitals are better utilised than those in public institutions. This is ascribed to the commercial nature of private healthcare and the consequent cost drivers that are absent in the public healthcare sector. While this study showed that utilisation at the selected test site is better than that observed in public institutions, where the range is typically between 30% and 40%, the observed 48% utilisation is significantly below the benchmarked range of 70 - 80%. Several factors may account for this low utilisation, including poor start-time discipline, absence of a good management and duration estimation system, and insufficient surgical patients and ICU beds to function at optimal capacity. The relatively high utilisation after 19h00 moreover has significant overtime and other cost implications for the hospital. In view of obvious capacity during working hours, and the fact that the majority of cases performed after hours were planned cases, this can be addressed and mitigated. It can be argued that the hospital studied could perform twice the number of surgical operations, raising utilisation to 96%. Alternatively, it might be concluded that the hospital is overcapitalised and that half the theatres could be shut down with no change in their capacity. The argument can be extended to suggest that the hospital bills its patients to recoup this cost of inefficiency, and that improved theatre utilisation would lead to a reduction in cost recovery from each patient. Such arguments are, however, potentially flawed, mainly because durations of surgical operations cannot be predicted with certainty and the impact of complications that may arise cannot be ignored. Although utilisation measured longitudinally may be characteristic, utilisation would typically vary from day to day, depending on caseload and the individual nature of procedures. Consequently a heavily loaded day, with overruns, may have significant overtime and patient frustration costs. These can, however, be absorbed by an 'inefficient' system. Nevertheless, significant benefit can be gained from improved scheduling aimed at raising utilisation into a capacity commensurate with theatre capacity. Achieving this goal of improved utilisation sustainably would require good management, more thorough planning and greater understanding of procedure behaviour. This would also impact on the current practice of reallocating theatres for emergency cases from spare theatre capacity. A more efficient hospital would be exposed to less risk, and costs arising out of idle assets would be reduced. Such a hospital could sustain current levels of earnings with lower patient costs, and would retain greater competitiveness and agility, which in view of the anticipated changes to health policy and practice in SA is surely desirable. Although this case study was confined to a single hospital site, personal observations at other facilities and discussions with practising surgeons point to the systemic underutilisation of theatre assets in the SA private sector. Repetition of this study at other sites is recommended, utilising the analysis tool which was developed for this study. Conflict of interest. This work was conducted in a South African private hospital. The authors are in no way affiliated to the hospital or to the hospital group. The research was not performed for gain, and no conflict of interest exists in publishing this work.